[tap, tap, tap…] "Is this thing live?" I mentioned in my last post that we inherited precious patchwork quilts from our grandmothers. However, when we got married, my husband’s Grandma Fleagle made us two brand new quilts as wedding gifts. One was this rose pink and spring green bedspread pictured below, the other a classic Sunbonnet Sue pattern, predominantly turquoises and warm pinks. 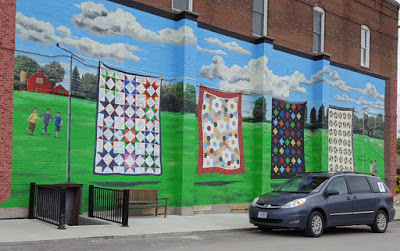 I was so honored to receive these quilts: they represented countless hours spent appliqueing and hand-piecing the tops, then quilting the layers, each tiny hand stitch a testament to her skill, creativity, and love for her family. We were by no means the sole beneficiaries of her craft – the woman could definitely church out the quilts! She lived in western Kansas and wasn’t able to travel to the wedding in Alton, Illinois, so she had my mother-in-law deliver them on her behalf. Little did we know that Grandma Fleagle wouldn’t be with us only nine months later. We were in the process of moving from Seattle back to the Midwest when we got the news she had died, so we made some route adjustments so we could arrive in Friend, Kansas in time for the funeral. Relatives gathered in the big old frame farmhouse, and the upstairs bedrooms filled up with folks staying overnight. The next day, the daughters were going through the mounds of sewing goods and quilting notions, wondering what to do with it all. 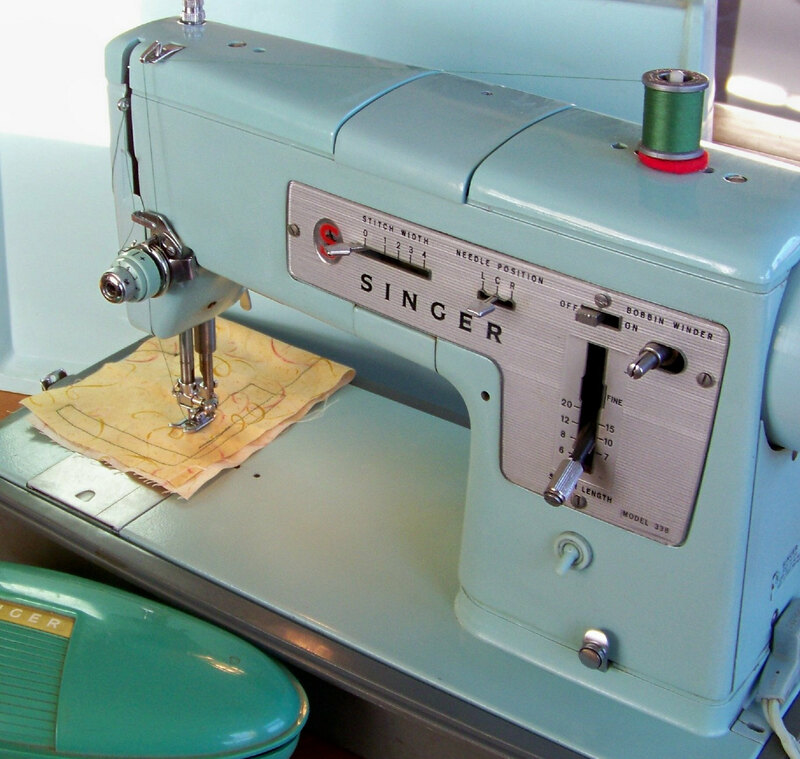 My mother-in-law suggested that since they and their daughters all had sewing machines, and since I did a lot of sewing, I should receive the Singer. It was agreed, but then they took it a step further and actually boxed up everything else to ship to me, too! The only trouble was that there was no address to which it could be sent – we were still in the process of relocating! It was a couple of weeks after we landed in Des Moines, when several boxes were delivered to the tiny house we rented. I believe the contents of those boxes could have stocked half a small shop! There were multiple scissors and pins and needles and many thimbles. There were bobbins and tape measures and snaps and buttons. There was lace and rick-rack and seam binding and zippers. And mountains of spools of thread. Cigar boxes and fruitcake tins, filled with notions of all kinds, not to mention yard goods. There were even things I had to ask others to identify! (Tatting shuttles were new to me.) I guess a person wouldn’t want to get snowed in way out there on the high plains without adequate provisions. Those supplies kept me stocked for a long, long time, and I appreciated being able to “shop” in my own sewing room. I was also hugely grateful to receive the sewing machine – I put that puppy to work for years and years to come. 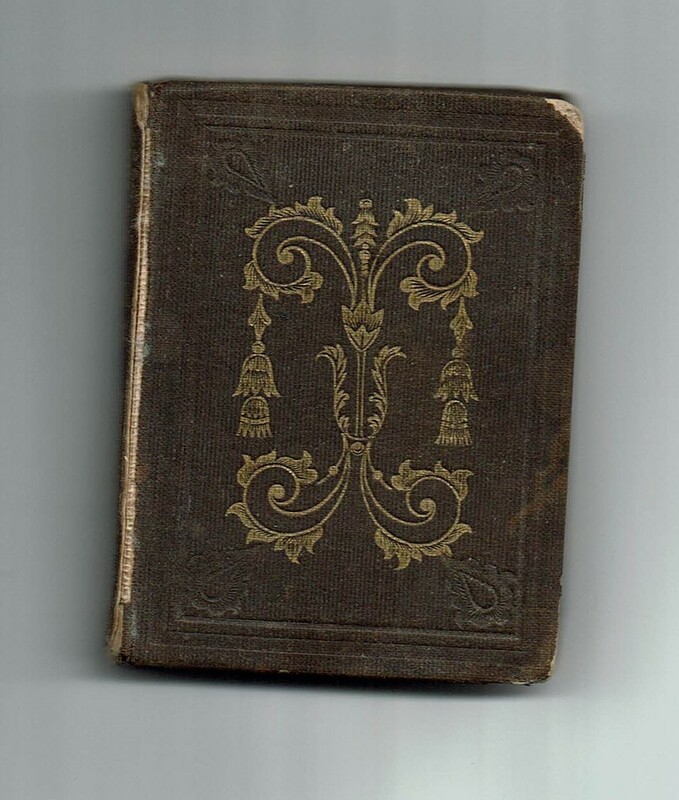 But as valuable as these things were to a cash-strapped newlywed, the absolute best find, hands down, tucked away among some hand-crocheted lace, was a tiny little volume entitled: Daily Texts with Verses of Hymns: Adapted for General Use and Suited for Every Year. It is the oldest thing in our house. And a treasure. The quilts I have inherited. 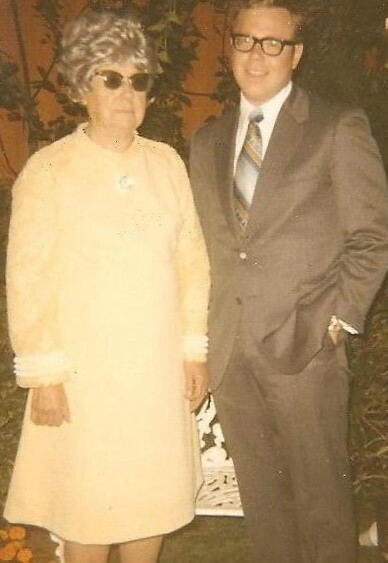 In 1970, my dad reconnected with a cousin he hadn’t seen in years at his dad’s funeral. In the course of their conversation, the cousin learned my dad didn’t have any keepsakes that had belonged to his mother (a fire had ravaged their family home not many years before my dad left home). 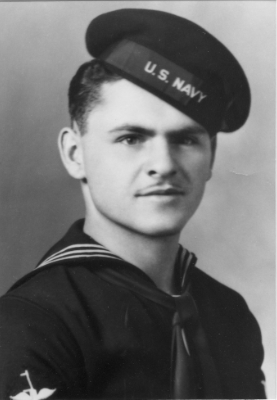 His cousin happened to have a few sentimental items that were my grandmother’s and he offered to ship them to my dad, along with three quilt tops.she had pieced and sewn together by hand. 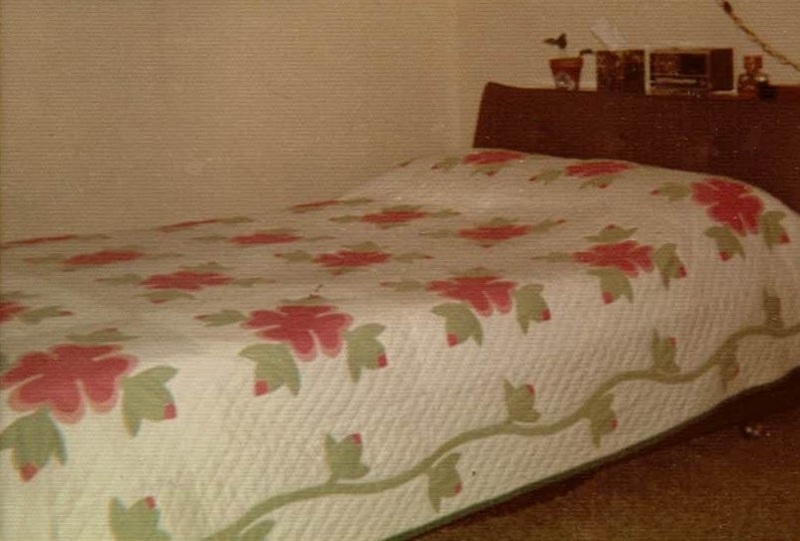 Shortly after I got married, Dad gave me one of them — a twin bed size quilt top. I purchased some batting and some fabric for the backing and began hand-stitching the layers together. The project occupied me for months through the fall and winter. Over the years, that quilt has been alternately placed on top of our bed, hung on the wall, and displayed across a quilt rack. Right now, it’s in the cedar chest along with a pink, blue, and white baby quilt given to my mother-in-law by her mother when my husband was born. It’s twin bed size too. 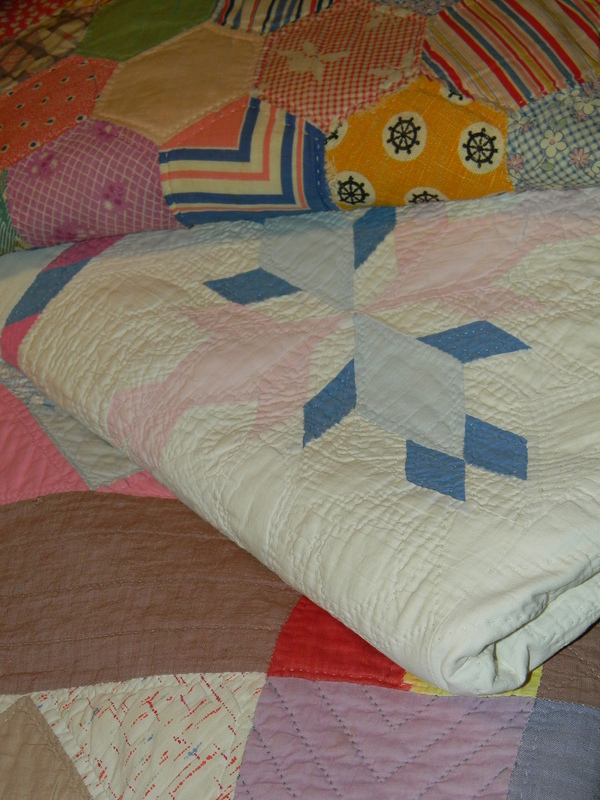 Along with those two quilts, I treasure a third: another one made by my husband’s grandma, this one, double bed size. “This fabric was from a housedress Mom wore,” Dad pointed out nostalgically as he bequeathed his mother’s quilt top to me. “And this one was from a dress she wore to church.” He lovingly identified the ginghams and calicos, the stripes and florals used in the honeycomb pattern of the quilt. “Oh, look! Here’s the fabric she made my pajamas from!” he exclaimed. He recognized fabric scraps from garments worn by his entire family. I noticed that some of the quilt’s pieces had to be patched together just to make a three-inch hexagon. This quilt wasn’t the product of a hobbyist’s whim, fashioned from yard goods bought from color-coordinated bolts of fabric at the mercantile. No, this gem had been pieced together from scraps — snippets of fabric the family couldn’t afford to toss out, set aside to be repurposed as functional household items for the winter. The second quilt my husband inherited is also fashioned from myriad small pieces of random prints. I love that the lively patterns and bright colors of all its snippets triumphantly defy the starkness of the times. When I look at it I see a hard-strapped farm wife managing meager household resources, capable of producing splashes of happiness and creating touches of beauty that could overlay the gray backdrop of a Great Depression. 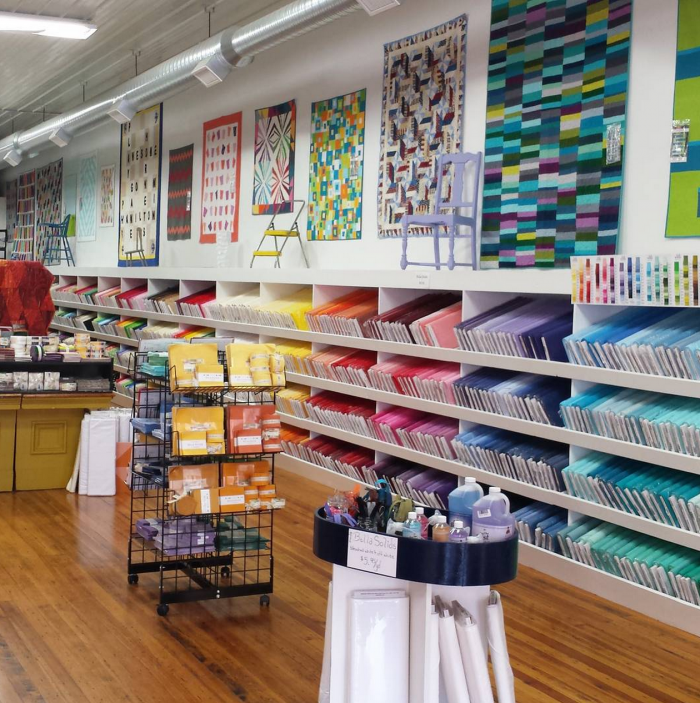 As I strolled in and out of the various quilt shops in Hamilton, ooh-ing and aah-ing at endless yards of splendid fabrics (some of them over $20 a yard! 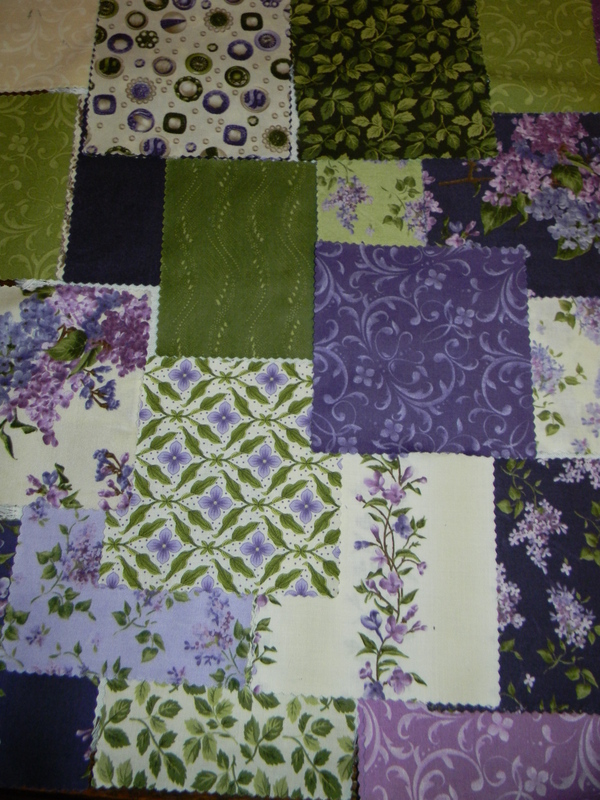 ), I was struck by the contrast between what quilting was during our grandmothers’ day and what it has become. Circumstances aren’t nearly so demanding nowadays. Necessity doesn’t drive me to harvest small scraps of fabric just so I can piece together blanket tops (as if I even sewed most of my family’s garments!). Instead, at the end of my browsing in those quilt shops the other day, I bought a small stack of brand new pre-cut fabric squares — enough for a coverlet. Even though they’re not salvaged bits of cotton, I do plan to piece them together with a similar randomness to the pattern as in the cherished heirlooms. And as I do, I will think of our grandmothers — reflecting on their hard-scrabble lives and being grateful for the legacy of these strong, resilient, and resourceful women in our lives. And who knows, I might get hooked. Americans are smarter than they used to be. According to an article published by the American Psychology Association1, IQ’s have been on the rise steadily in this country for the last century. That makes the average person today smarter than 95% of the people living 100 years ago! Which is not to say that our brains have suddenly been engineered to accomplish greater things, but rather that our ability to attack a wider range of conceptual problems has improved. And get this – it’s due to the complexity of modern life. My childhood happened in a simpler era: there was one breadwinner, one family car, one phone wired to the wall, and only three TV channels. 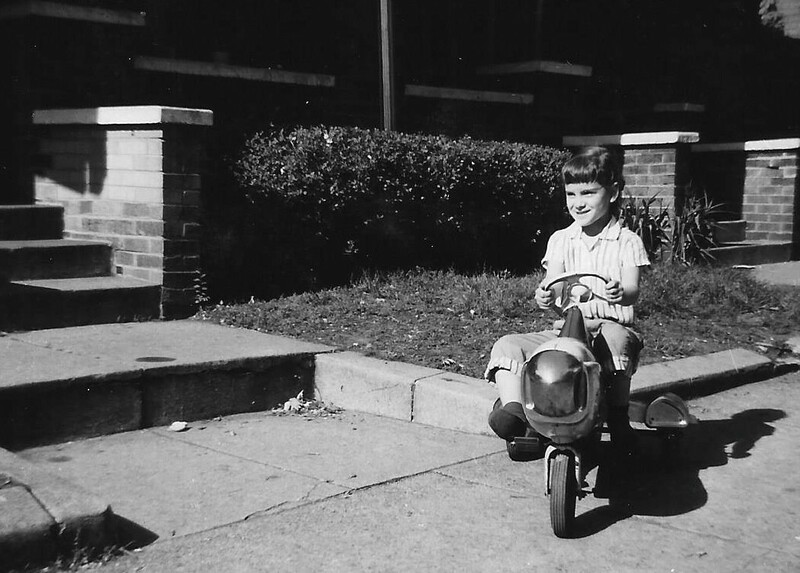 We walked to school and came home for lunch, and we either walked or rode our bikes to after-school activities like Little League or Brownies. We would even walk to Sunday school. Way less complex. Always had a negative outcome. Color me a slow learner. Exhibit A: I loved to ride my bike in the summer, and I also loved wearing flip flops. However, these two things never mixed well. But did this affect my decision to ride a bike in flip flops again and again? “Moooooooom!!! I’m bleeeeeding!! !” I would wail as I charged through the front door. “What happened?” she would ask, lifting me up onto the kitchen counter to get a closer look. “Okay, we’ll wash it up and put a Band-Aid on it. It’ll be okay.” Then out would come the mercurochrome2 and a small metal box full of bandages. My folks should have bought stock in Johnson & Johnson for all the Band-Aids I blew through. No pity is due me here, though. I owned tennis shoes. I just opted – again and again – not to wear them. Exhibit B: There was a huge catalpa tree on our block. We called the long pods that hung from the branches “Indian cigars”. Were these pods actually cigars? No. But did that stop us from trying to light them so we could smoke? (Unfortunately tobacco products were in vogue during this “less complex” era.) Again, no. 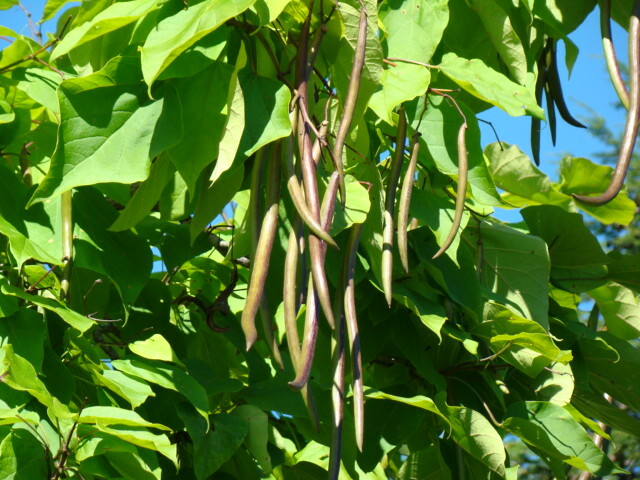 I was recently admiring a magnificent catalpa tree in my cousin’s front yard, loaded with pods. Yes. I knew kids weren’t supposed to play with matches. But I don’t recall having to be involved with the fire directly, seeing that I had an older brother. So fire was easily obtained, but the concept of freshly picked catalpa pods being utterly inflammable due to their water content, was not so easily grasped. We repeated that little ritual at least once a season, sad to say. Exhibit C: Summers were not only full of scraped toes and catalpa pods, they were also teeming with – lightning bugs! And we meant to capture them! Not once did I wake up in the morning to find live lightning bugs. Always dead – every single time. 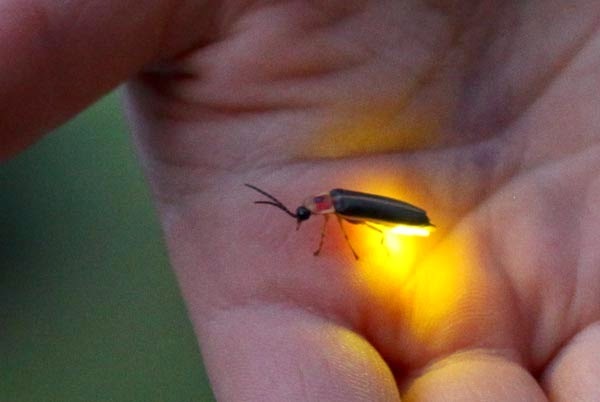 But did this grim reality inform future lightning-bug-catching expeditions? Not in the least. We carried on in like fashion, ad infinitum, summer after summer. De facto serial killers. All on account of being not so sharp. You know, I hear from a lot of my peers that they aren’t too thrilled about getting older. But I say bring it. With the increasing complexity of the technologically advancing world, I think I finally have a shot at getting smarter. Once upon a time, a staple of the family medicine cabinet. In 1998, the ubiquitous mercurochrome was declared by the FDA as being “not generally recognized as safe and effective” as an antiseptic. Suppose it had something to do with the mercury? Woohoo! The 3-day weekend has arrived, bringing with it the official end of summer, family barbeques and picnics, and perhaps a parade. And it might be your last chance to go camping. It’s the last bash of the season. But, you ask, exactly how does all of this honor the American worker? By giving all of us an extra vacation day! Since Americans work more hours than any other industrialized country, I think we’ve earned it. This post is dedicated to the American worker – the common laborer who contributes to the strength, prosperity, and well-being of our country. More precisely, to this American worker and her very first foray into the world of work. Those of you who know St. Louis, know that this establishment is iconic in the Gateway City. But I knew it as a place where a gal could pull down some serious tips as a carhop. The owner happened to be there and conducted an interview with me right on the spot. I was hired. Mrs. Drewes knew that maintaining a stellar reputation in frozen custard world is serious business, and her tone said as much. She gruffly detailed the rules, handed me a few uniforms and aprons, and told me when to show up for my first shift. I didn’t react much until I got on the bus to head home. I was elated. I had landed my very first job. I was at that stand five nights a week through the rest of the summer, from about 6 p.m. to midnight. Because it was a very popular family destination, the parking lot was packed with wood paneled station wagons between suppertime and about 10:00 p.m. Cars would even circle the lot waiting for spots to open. Folks were also serious about frozen custard. Mrs. Drewes didn’t actually pay carhops. The deal was you could work for tips. And we high schoolers were more than happy for the opportunity to beat the asphalt for six hours at a stretch to score those tips. Bona fide American workers contributing to the strength, prosperity, and well-being of South St. Louis. When the family began clearing out, the same parking spaces were occupied by a steady stream of young people cruising around town. 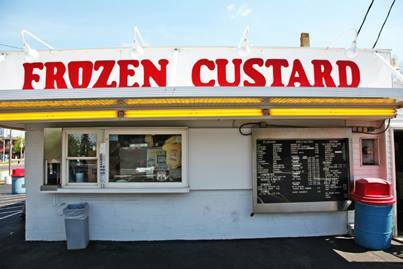 Young people are pretty serious about frozen custard, but not quite as serious about tipping. But the sheer volume would make up for it. 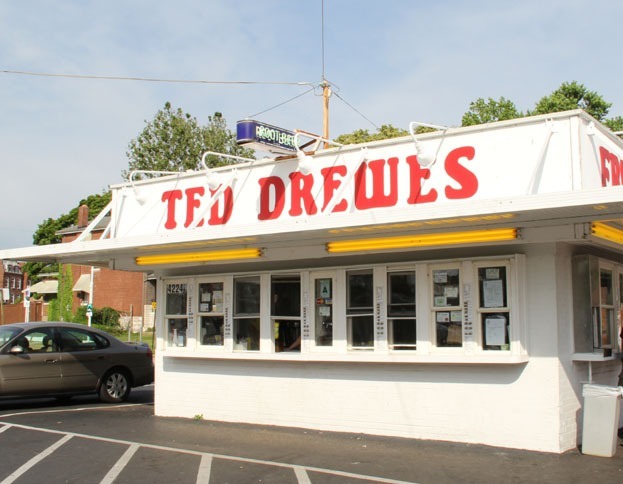 The Ted Drewes recipe consisted of four ingredients: cream, eggs, honey, and vanilla. No chocolate, no swirls. Just vanilla. But it was as delicious as it could be. 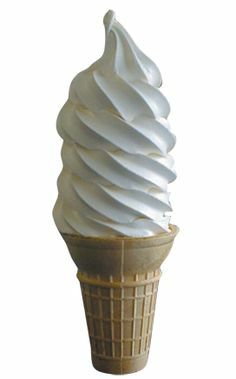 And the Drewes operation produced a texture that was sheer perfection. Tips weren’t the only perk of the job. Our uniforms were a lot like this, only white trimmed with blue. One of the inside workers – they were paid an hourly wage – introduced me to a new concoction. He put a squirt of strawberry topping in a drink cup, then filled it with lemonade and ice. Who knew the combination would be so yummy? This dude drove off with one of my trays one night. At the end of my shift I had to pay Mrs. Drewes $1 to replace it. She had explained that particular rule at the very beginning, so it wasn’t a surprise. But I was still burned. $1 was a good-sized chunk of what I could earn in a night. Service got very slow at about 10:00 p.m. on July 20th. There was a TV mounted on the wall inside the stand and we carhops lingered at the window for as long as possible. Our eyes were glued to Neil Armstrong walking on the moon. And for a moment, that was more serious than out-of-this-world frozen custard. City buses weren’t running any longer by the time my shift ended, so my dad would always come pick me up. Then every night I would sit on my bed (with my feet up), count my loot, and roll coins. At the end of the summer I had amassed enough earnings to buy all my clothes and shoes for college, pay for a plane ticket to L. A., and had $300 to spare. And I had become a slightly seasoned member of the American work force. I was in a group one time when we were all invited to share why we were grateful for our mothers. I could hardly believe how unabashedly sentimental folks got. Why, the things they said about their moms were worthy of a Hallmark Mother’s Day card. My favorite was the guy who told us about getting “butterfly kisses” when he was little. He described his mom lifting him onto her lap, putting her face very close to his, then blinking so their eyelashes would touch. This from a grown man who had built his own house with his bare hands. Butterfly kisses. There really is something about moms and how we feel about them. As the most primal relationship we will ever have in life, she is quite literally our life line in the beginning. But then as we leave infancy, we start teasing out our own identities, celebrating our separateness, and triumphing in our new ideas and opinions. But she’s still our life line. No amount of two-year-old swagger can negate this fundamental reality. 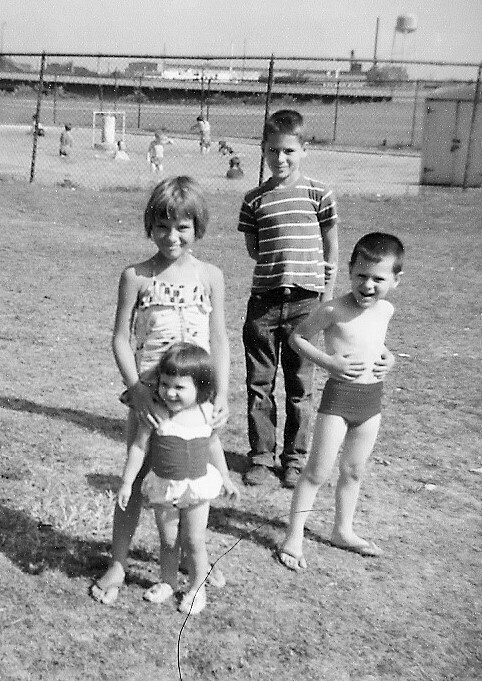 I got a little too big for my britches once when I was about three. I kept ignoring my mom’s instructions to stay with her while shopping in a department store, being more interested in playing underneath the dress racks. But my mom got weary of chasing me down and decided to help me learn an important lesson. She “hid” until I noticed she was gone. When I finally realized she hadn’t come looking for me in a while and looked up to spot her, I got a little panicky. (She was watching the whole time, so I was never in danger.) It worked. I determined never to let her get out of my sight again. Because mom is critical to a child’s well being. This truth became even more evident one day when I was in about second grade. I came bursting through the front door and made my usual beeline for the kitchen. Something about the way she answered led me to suspect something was amiss. When I walked through the kitchen door, I saw she had her lower leg wrapped in an elastic bandage and propped up on a kitchen chair. A torrent of questions flooded my mind: If Mom is unable to get around, who is going to take care of us? Who will fix us dinner? And where in the world is DAD?!! Having no context for a badly sprained ankle and how this thing might go, I was plunged into a sea of insecurity and worry. I slowly walked out of the room, feeling disoriented, I wondered what it all meant. It wasn’t long before she needed to go to the bathroom, which meant a trip upstairs. She had already figured out she could get around by rolling on a task chair she used for sewing. But when she got to the staircase, she had to turn around and go up one stair at a time on her bottom. That was it. My world was officially unraveling. 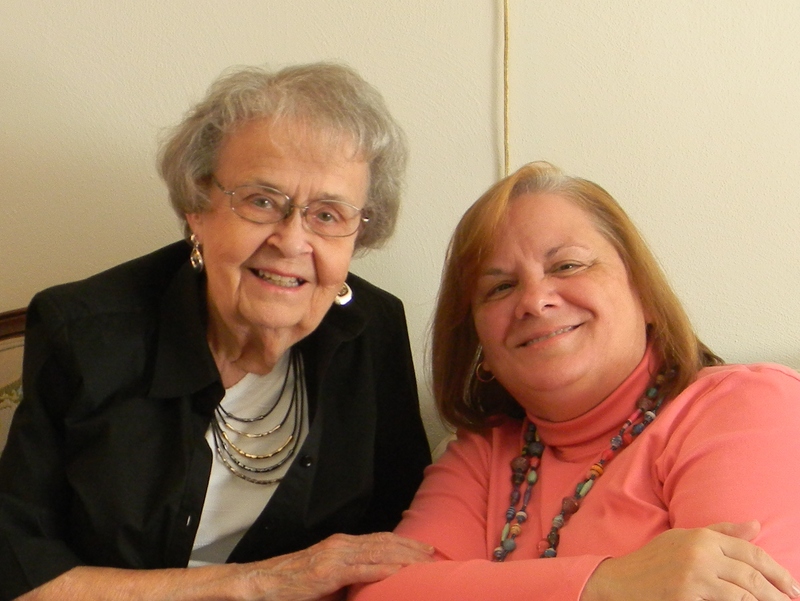 It was clear to see that my mother was functionally disabled and that life as I’d known it was now over. Fortunately, my high anxiety didn’t last all that long because Dad eventually got home and took the helm. The details of what happened from this point elude me, but apparently we did eat a meal, did some homework, got our baths, and went to bed – all without incident. And apparently the injured ankle healed in the normal time frame. However, I never forgot how devastated I felt as my imagination ran amuck. The thought of her being taken out of commission and not being able to care for us had absolutely rocked my world. Eventually, I got a little older and began to believe I didn’t need her so much. After all, I was getting to be pretty mature, you know. I mean, not too much longer and I’d be learning to drive. The high water mark of this wave of denial came about the time I packed a steamer trunk and a couple of suitcases and got on a plane to go to college in California. Curiously, from that very moment on, I’ve been returning to – albeit, at a glacial rate – a level of knowing how truly vital my connectedness to my mom is that rivals my early childhood. Obviously, I no longer depend on her for the practical support I was so concerned about when she got injured. Nowadays it’s just emotional support I yearn for. How aware I’ve become of this phenomenon in the past several years surprises me. I was with Mom just last weekend. We’d been out and about all afternoon, then returned to her house for a snack before I headed home. As we were in the middle of a good conversation, I noticed this impulse I kept having to tell her stuff, hoping and waiting for her affirming comments. It was sort of like a verbal variation of handing her my pictures to put up on the fridge. For cryin’ out loud, Linda, grow up. You don’t have to be the center of attention here. Why don’t you just try listening to her stuff and celebrating it. Like an adult. But as much as I wanted to, I couldn’t stop the impulse. Because no matter how old we get, we still love butterfly kisses from our moms. I think Americans are conflicted. About 18-wheelers, in particular. We want, and even expect, that our every creature comfort be stocked and ready to go, 24/7. We’ve been grown attached to, and even dependent upon, all this stuff that gets transported from its point of origin by truck. I know there are rude truck drivers. And some drive dangerously. But I like to remind myself whenever I get frustrated by a trucker (who, let’s say, decides to pass another truck and ties up both lanes of the interstate for several miles) that they’re just making a living while performing a demanding job that ultimately brings my stuff where I want it to be, and he likely just wants to get home in time for his kid’s birthday party. 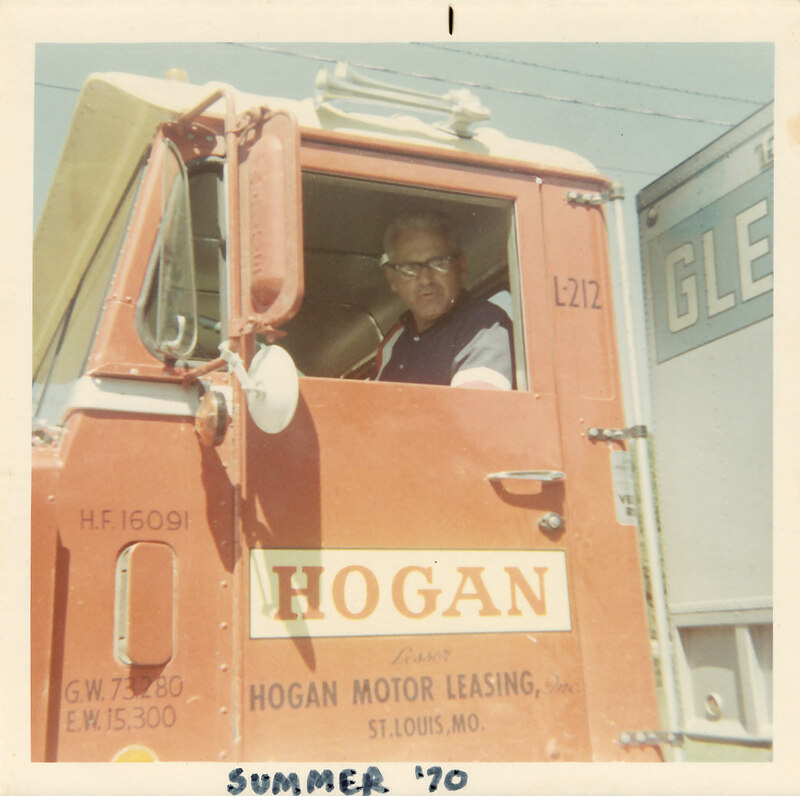 My dad drove a truck from 1970 until he retired, all across the interstates of America from the East Coast to the Rockies, and from the northernmost states down to the Gulf. He logged some serious miles, wore out a bunch of Rand McNally road atlases (pre-GPS), and slammed down enough coffee to fill a lake, I’m sure. His excellent safety record would occasionally be marred by making split-second decisions like jack-knifing a rig rather than plow into a VW Beetle that pulled in front of him and then stopped on a dime. Another time, he had a right front tire blow out when he was carrying air compressors. He was unable to maintain control of the vehicle, and it veered off the roadway and into a field. He later said, “When it rolled, compressors came shooting out of the top of that trailer like bowling balls out of a paper bag!” The cab came to rest upside down, with him dangling from his seatbelt. He made another unpleasant decision – to unlatch the buckle, meaning he would land on his head. He considered himself blessed to have walked away from that incident without harm to himself or any other motorists. Nevertheless, his safety record got dinged again. I got to ride with him once. I was home from college during summer break and he was making a run somewhere out east. I had been hankering to see my cousins and since his route would take him right through Indianapolis, he suggested he drop me off after the first leg of the trip, then about a day and a half later, he’d pick me up. Sounded like a winner to me. Well let me tell you right here and now, the right seat in the cab – at least back in the day – will jiggle your liver loose. Meanwhile, the driver’s hydraulic seat floats blissfully down the highway. And the noise. So much noise. I discovered a new kind of violence that could be perpetrated on the hair cells of one’s inner ears. However, despite these discomforts, there was a major compensation. I can’t remember ever having a more delicious breakfast than the one I ate with Dad at about 1:30 a.m. (somewhere in Illinois – I was pretty groggy when we stopped). I think we ordered eggs, hash browns, pancakes, and the best chipped beef gravy on toast ever – and washed it all down with the quintessential brew, no cream. As I gushed about how wonderful it all tasted, he informed me it was actually pretty typical, because truck stops that don’t dish up good food, don’t stay in business. Made sense. Quite a few years later, after Dad had retired, I was visiting at my parents’ with my two little ones in tow. As I gathered our stuff and headed for our van, Dad asked me if I wouldn’t rather just spend the night, since it had gotten so late. Heh heh, I had gotten him where he lived, as they say. “Doesn’t sound like I can talk you into staying.” Parents are often unsatisfied with their adult children’s decisions. As expected, the van didn’t even hiccup, so I would neither be able to confirm nor deny the presence of slashers trolling I-70 that night. The promised phone call was brief. About six months later, my parents came over for a jazz concert in which my two older kids were playing. As we piled into two vehicles to come back to the house, the guys were in the car ahead, and Mom and I took the van, with the two little ones in the back seat. I meant to stop at the gas station earlier that afternoon. Really, I did. But they were temporarily closed to install new underground tanks. (Note to self: stop for gas at another station further down the road, after your next errand.) As fate, and my attention deficit, would have it, I never actually made it to the gas station that day. It became an issue on the way home from the concert that night, about a mile and a half from our house. When the van sputtered I knew immediately I was toast. It came to rest within a couple hundred yards of the exit ramp we would have taken. I was glad I had on flats, since I’d be walking to the convenience store, less than a mile away. I put on my flashers and opened the side door of the van so I could let the kids out of their car seats. Grandma would watch them. It was dusk, but the lights that pulled up behind us nearly blinded me. “Need some help?” he asked as he approached. This Good Samaritan got out of a truck. That’s right. He pulled his semi onto the shoulder to see if a woman in a minivan needed help. I said I’d be fine, since there was a phone just a little ways down the road, on that exit ahead. He offered to make the call for me. “No, let me do it,” he insisted. So I handed him a slip of paper with our phone number, thanked him profusely, and he drove off. About ten minutes later, my husband showed up with some gas. Crisis completely averted. Now, the humor in this scenario wasn’t lost on me or Dad. We would smile about that one for years to come. My dad lost his job when I was 9 ½ years old. 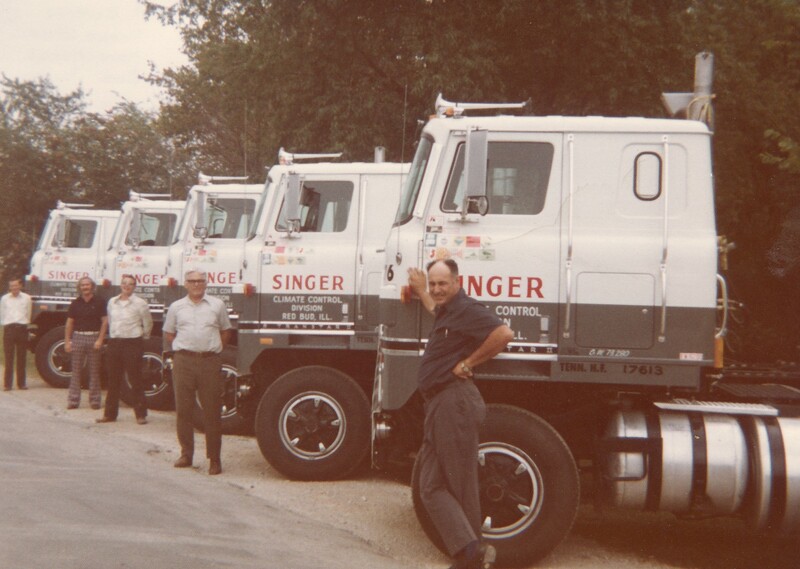 It was a while before he found his niche as an over-the-road truck driver and managed to get his footing. In the meantime he worked a series of odd jobs. They’re called odd” jobs, but these were fairly run of the mill: general laborer in a sheet metal plant, shipping clerk, mechanic in a transmission shop, custodian, etc. He didn’t really stay at any one of them very long – weeks? months? maybe a year? – but none of them actually suited him like trucking eventually would. One of these odd jobs was noteworthy, though, simply because of an incident that occurred while he was working that job. Dad was hired as an attendant at a full-service gas station – you know, the kind where they rolled carts of tires out of the bay and closer to the sidewalk each morning, where you got your windshield washed and your oil checked with every fill up, and where if you need the ladies’ restroom you had to go to the office and get a key (that would invariably be hanging on a nail and also chained to a random block of wood!) to unlock the door which would be on the outside of the building, toward the back. That kind of gas station. Self service and convenience stores weren’t a figment of anyone’s imagination just yet. The owner would open the station early in the morning and work till about 3:00, then Dad took over in the mid afternoon and worked until close, at 11:00. It was very near the end of Dad’s shift and he was nearly finished with the close-up-shop routine. Then all of a sudden, before he even knew what happened, two men rushed into the office and held him up at gun-point. But what was happening registered, Dad was scared. Fortunately, he had a capacity to stay calm and level-headed in emergencies, so his demeanor under duress probably influenced the outcome of the ordeal. The robbers demanded he give them all the money on the premises. Who knows whether they imagined the amount of cash to be large enough to make it worth the risk, or whether they were just desperate. But it became obvious they had been casing the station and knew exactly when Dad would likely be alone as he shut things down. Once they had the loot they forced him into a storeroom where they bound and gagged him. Despite being a man of faith, Dad was acutely aware that these could be his last moments on earth. “Shoot him!” one of the men shouted to the other. But then nothing. I imagine that during those surreal few seconds, amid the shouting and his own racing thoughts, he would have been struggling to come to grips with his role in this grim drama, and his wife and five children, asleep at home, might have flashed through his mind. But I also imagine this to be the very moment when the guardians of his fate intercepted and totally overcame the minions of darkness that threatened his demise. And in a flash they were gone, leaving the eye witness behind, unharmed. Dad spent the rest of the night on the floor, unable to free himself and with no way to summon help. When his boss arrived in the morning to find the station wide open and unlocked, he immediately realized something was amiss and quickly found Dad. He freed him and drove him home. Later that morning while Dad slept, Mom filled us in on the terrible events of the night before. I was relieved and oh-so-grateful that my dad’s life had been spared. 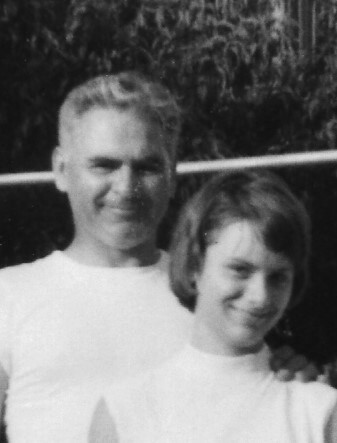 Dad would go on to eventually find a job he really liked, fix up a house, watch his five children grow up and give him grandchildren and great grandchildren, involve himself in his neighborhood, serve in his church, cultivate iris, collect and enjoy books and recordings, eventually retire, celebrate a 60th wedding anniversary with his wife, and all sorts of other life-embracing activities. His was a full life. Perhaps his most precious endeavor was comprised in a collection of cards he kept in his den, right beside his blue easy chair. 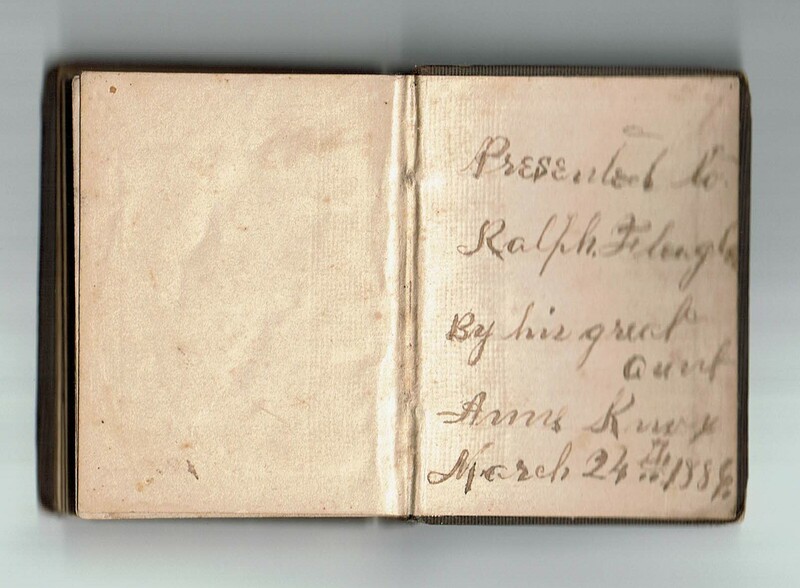 He once showed me the thick stack of sturdy 4×5 note cards, each bearing a name inscribed in his distinctive calligraphy. Each card was covered in a hand-drawn grid, like graph paper, and each had a varying number of small boxes filled in. He explained that each time he prayed for that person he filled a little square. He pulled out the card bearing my name. I was slightly crestfallen when I saw that mine didn’t have as many filled-in boxes as some of the others. Then he showed me another card that also had my name at the top – but this one had been completely filled in – front and back! He had prayed for me so often that he had to make a new card to catch the overflow. I was staggered by the sheer number of tiny boxes, hundreds per card, each representing a separate petition. I was stunned by the relentlessness with which he lovingly covered everyone within his embrace. My siblings all had cards. Their spouses had cards. The grandchildren. Their children. His in-laws. Their families. His buddies. His neighbors. His friends at church. You name ‘em, they had a card. I suppose when the possibility of a person’s very existence can be traced back to a single moment in time that perhaps pivoted on a prayer, one could become pretty convinced of the value of praying. 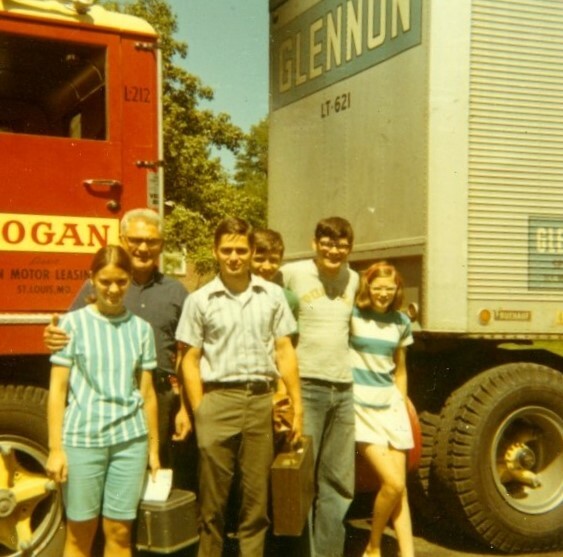 In gratitude for having dodged a bullet, you might say Dad “prayed” it forward. Like nobody else I ever knew. There’s this verse in the fifth chapter of the very last book of the Bible that refers to golden bowls in heaven filled with incense. It says the incense is the prayers of the people of God. There are moments in my life – to this day – when I feel like I’m still a beneficiary of his many prayers for me. It’s as if one of those other-worldly bowls gets tipped and then a prayer offered years ago sloshes over the rim and spills into my life. 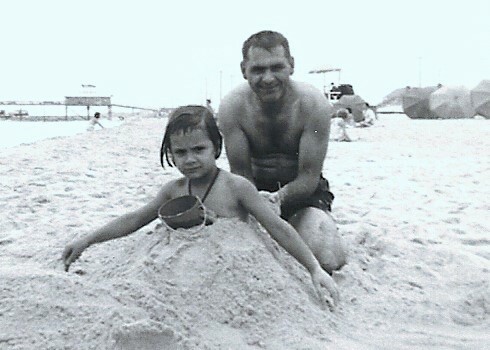 And I reap continuing goodness sown into my life during my dad’s years on this earth. Summer break’s over. I’m back. It would seem that all the blather back in June about getting braced for a sweltering summer was just a bunch of noise. Because the summer, at least here in mid-Missouri, was colossally pleasant. Until this past week. I’m feeling slightly less like a whiner now that we’ve had a series of days in the mid-to-upper 90’s. This turn of events might just redeem that Summer List. Or not. I loved, loved, loved staying overnight with cousins when I was a kid. On this particular occasion, I was with my mom’s younger sister and family. In the middle of some rollicking play, my aunt announced we’d be going to church that evening. The idea of mid-week worship was novel to me, but hey, count me in. After all, when in Cousinland, one does as the Cousins. Everyone got cleaned up after being outside all day, ate our dinner with dispatch, and filed out the front door behind my aunt and uncle like a goose and gander with their gaggle. We strolled down the small town street, block after block, until we found ourselves in a field, wherein was a big tent. My young eyes drank in everything as we made our way through the very large gathering to a row of seats in the middle, about half way towards the back. The big stage, the music, sawdust carpeting the aisles — I was fascinated by it all. It’s way too many years later to tell you what songs the choir sang, whether the soloist was excellent, or even what the content of the evangelist’s message. What I do remember is someone passing me what seemed like a giant popsicle stick with a rounded cardboard rectangle fastened to it, an on it was the logo of a local funeral home. I observe silently for a minute or two, and then tried my hand at my own fan waving technique. 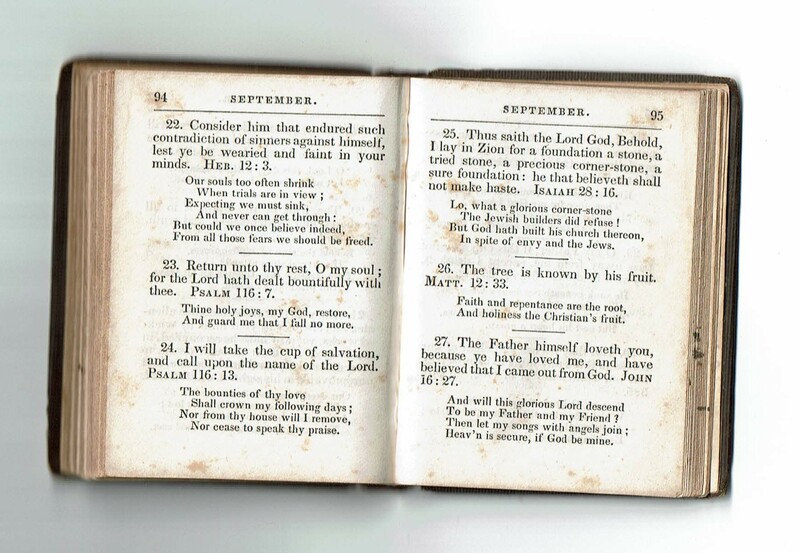 Somewhere during the the evening, I witnessed something that I would later learn was rather iconic for tent meetings such as this: individuals from the audience rose from their seats and — quite literally — walked that proverbial sawdust trail. I didn’t appreciate the significance of this particular practice, but was nonetheless intrigued. As we walked home, I remembering wishing my family could have been there, too. Without further ado, I will share Neil Diamond performing his “country” song, Brother Love’s Traveling Salvation Show in which Diamond gives the back story. It’s time to brace myself for the inevitable. Never has such a simple household implement consistently delivered so much bang for the buck! Makes me want to thank the inventor. Alas, I cannot, seeing that the fellow who got creative with ox gut lived about 400 B.C. More recently — only 400 years ago — a Dutch dude made hausen out of linen, then later his countrymen switched to leather. Eventually, rubber and then vinyl would be fashioned into the bright green coils. Much better than ox gut… eew! I loved the garden hose from the moment I could manage the spigot on the side of the house. Because hoses could be attached to sprinklers! And playing in sprinklers is one of the absolute giddiest forms of fun. In addition, quenching summertime thirst from a makeshift water fountain ranks pretty high on the fun-o-meter too. (Garden hoses have been known to occasionally tempt me to surprise attack and terrorize neighborhood boys. Had to be careful with this one, though — paybacks could be intense. I still enjoy special garden hose moments, but not so much for reasons mentioned above. I mostly prance around the yard watering flowers and herbs and vegetables. Nowadays, I tote my hose on a nifty little wheeled caddy. Once again, a thank you note to an inventor is in order. And from time to time, I might pause to fill a few water balloons. Heh heh. 2. Swimming pools (and other bodies of water). It didn’t matter whether it was a municipal pool, a four-foot inflatable number, or a body of water found in nature — if it accommodated the immersing of oneself while the heat was beating down, it’d do. Spent a lot of time and took a bunch of swim lessons at the city park pool, and had the prune fingers and chlorine split ends to prove it. Pools are still very cool, but you won’t catch me doing canon balls off the diving board any more. Lolling on inflatable rafts or noodles is more like it… oh, yeah. 3. Sno Cones (and their step-cousins, popsicles). So much refreshment to be gained from these icy colored-sugar-water treats! What can I say? Good to the last chunk of ice. 4. Kool-Aid. So many flavors, so many rainbow mustaches. Stirring the Kool-Aid was perhaps the very first meal prep chore entrusted to me. It would be served up in aluminum tumblers, giving the sugary drink even more chill. 5. Movie theaters. Boy, o boy, how I loved sitting in air-conditioned movie theaters. Many stores and public places back in the day were proud to display their window decals, “Come In — It’s Cool Inside!”. But you could sit for at least an hour or two in a movie theater — an environment as awesome as standing in front of the frig with the door wide open (“Close the frig, young lady — you think money grows on trees?”). Movie theaters are still calling to me. Not that I go all that often, what with the pricey ticket (I usually try to swing a twilight showing to maximize the old entertainment dollar). After all, who can resist beating the heat while being charmed by little yellow minions, et al. Well, this has been nice. * A one-time event which hasn’t exactly carried over but is nevertheless worth honorable mention: When I was about 11 there was a Friday night when it didn’t seem to cool off at all, so at 10:00 p.m., it was still probably 90 degrees in our bedrooms. Trying to fall asleep in pools of perspiration was proving utterly futile, when my dad took a notice to drag our mattresses out onto our large balcony style porch, affording us r-e-l-i-e-f. Now that was cool. He didn’t really talk about it very much. But then, neither did his peers. For reasons of their own, their memories, by and large, remained private. 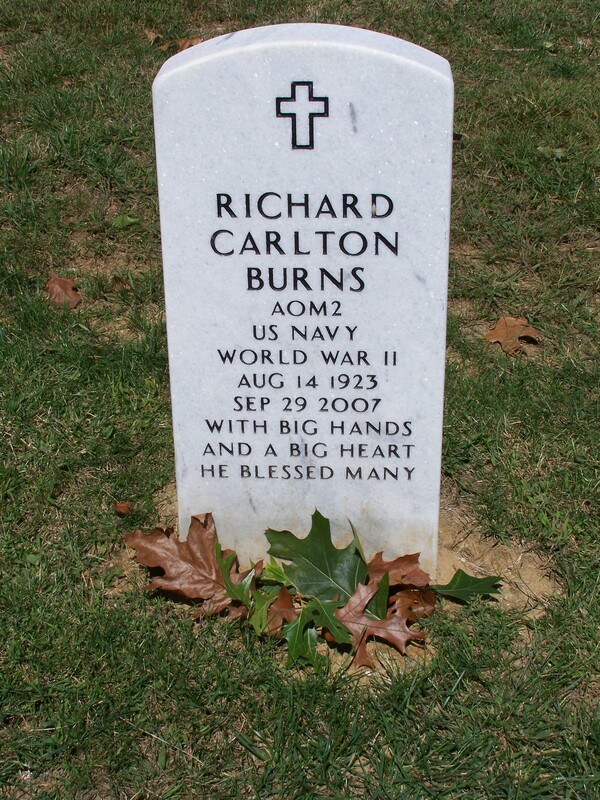 His tour of duty exacted a toll on the civilian life he returned to, but that’s a story for another post. 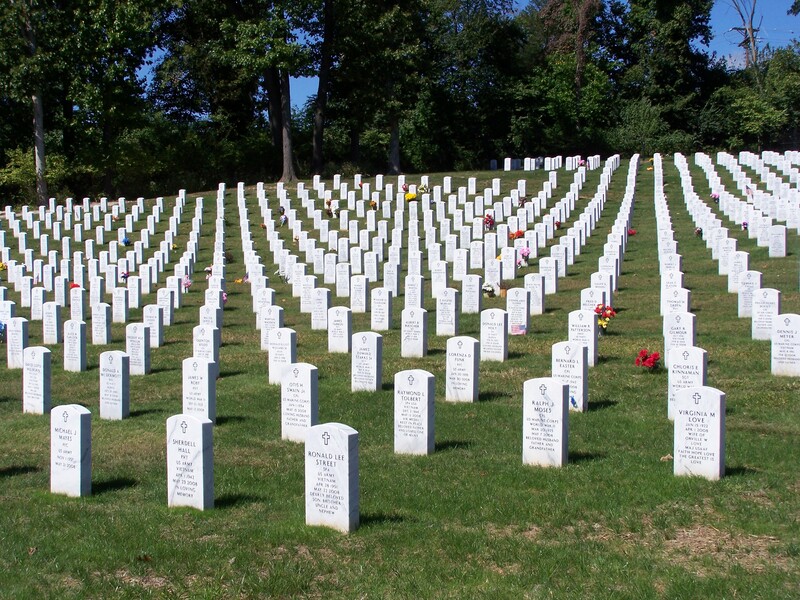 On holidays like today, reflecting on all the sacrifices made, I feel a little wistful. So much more significant than just a long weekend for barbeques and camping trips.